We had the opportunity to facilitate a review for the new TheMomGiftBox by Jennie Garth. Do you all remember Jennie Garth, she played in a popular television teen drama show in the 90's 90210. I think it's pretty cool that this lifestyle subscription box for moms was designed by her. 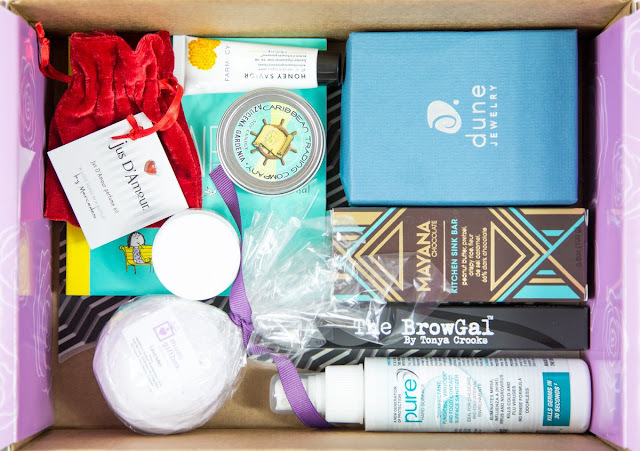 I don't know a mom yet who doesn't like receiving a curated subscription box. It's exciting to see what surprises and treats you will receive. 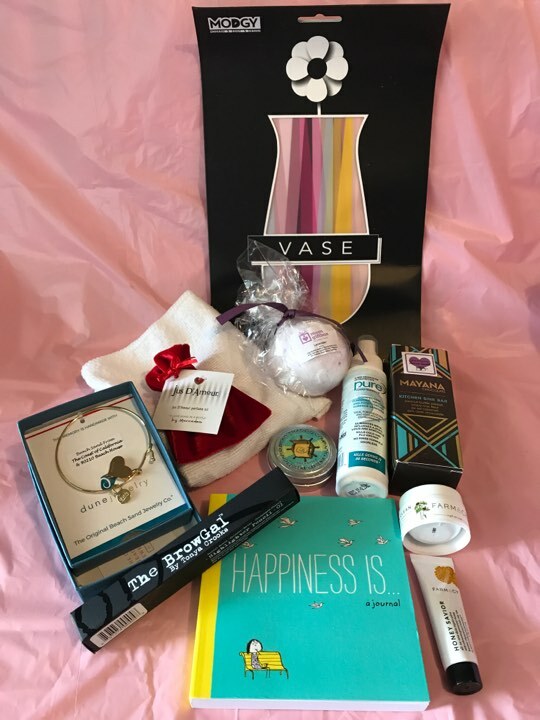 The Mom Gift Box does not disappoint it is packed with goodies. Allow me to tell you what we received in our Mom box. A Modgy Glacey decorative vase. This expandable decorative case will not break, chip or even collect dust. it will go from flat to standing perfect after adding water. It is a very modern and chic vase. The retail price for the Modgy Glacey vase is $8.95. The Browgal Pencil is a double ended pencil for brows. It comes in Champagne/Cherub colors with one end matte and the other end is a shimmer. The matte end is designed to shape the brows while adding a shimmer accent. The Browgal Pencil is retailed at $20. Farmacy Green Clean Make up Meltaway Cleansing Balm is retailed at $4.50 . It's simple to use. Just massage into skin and rinse off. The balm melts right into the skin and dissolves away make up and other skin pollution leaving skin smooth, soft and moisturized. No formaldehyde, parabens or artificial coloring. The Farmacy Honey Salve All-In-One skin repair salve retails at $7.39. This salve is for dry and irritated skin. This combines honey with amino acid rich royal jelly that helps in nourishing the skin and pro palace which is a natural anti-septic from beehive. It can be used for a lot of purposes such as dry hands chapped lips cracked heels and more. It's all natural with no strong smell. It is safe to use on yourself as well as children. The Caribbean Trading Azusena gardenia scented so away candle retails at $4.50. This small candle has a spicy sweet floral scent coming from a combination of tropical tube rose gardenia and zesty Orange flowers. This candle is Soot free and has lead free cotton wicks and is 100% natural. The Jus D'Amour Perfume Oil by Mercedes is a timeless blend of Coco Palm, Aqualeaf Accord, Night Blooming, Jazmine, Violet Tahitian Vanilla and Sandalwood. This exquisite perfume comes enclosed in a pretty red pouch. I was not able to find the exact retail price for this product. The Mayana Chocolate Kitchen Sink Bar is a delicious piece of chocolate. It has pretzel crispy rice peanut butter milk chocolate and flour de sel Carmel all covered in an extremely tasty 66% dark chocolate. This is a Real chocolate not just a chocolate coating. Every bite is amazing. The retail price of this chocolate bar is $8.00. The Pure Hard Surface Sanitizer with a cleaning cloth provide 24 hour residual protection and kills a broad spectrum of microbes. This is awesome for me a and it is odorless. The cleaning cloth that comes with the sanitizer is made of 80% polyester and 20% polyamide. The Dune Jewelry Custom Bangle retails for $44 and comes in a cute little box that makes gifting perfect. Dune Designs jewelry using beach sand. The gold plated bangle is a heart that is approximately 17 mm in diameter. The happiness is journal by Chronicle books retails for $8.95. This is a sweet little journal that will remind you that happiness comes in even the simplest things. The pages are filled with Q doodles and a space where you can jot down all your happy thoughts. The Mom Gift Box is a great way to let mom know you're thinking of her with a delivery of a fabulous products right to her door every month. Each box is filled with quality products like skin care, stylish accessories, fitness products, delicious treats, Technology items and all natural cosmetics. Mom Gift Box contains a variety of products that come in both sample and a full size. They focus on items that allow moms to be pampered and enjoy a wonderful and relaxing experience. They select the finest all natural personal care products, high quality fashion accessories, fitness accessories, gourmet snacks, stylish apparel, fun jewelry and more. They focus on quality products and giving moms the best experience each month. The cost of The Mom Box per month is $49.99 and free shipping. Each box will have a variety of high-quality items and ship to the US only. The Gift Box family support a range of charities including petsforpatriots.Org, FamilyReach.org, MusicDrivesUs.org When you checkout you have the opportunity to select which charity you would like your purchase to benefit. We would recommend this Box to every mom. The products are high quality, the treats are amazing. Any mom would feel excited to get this. The TheMomGiftBox has generously given our readers a discount for 20% off your first box! Just enter the code momtograndma20 when ordering. 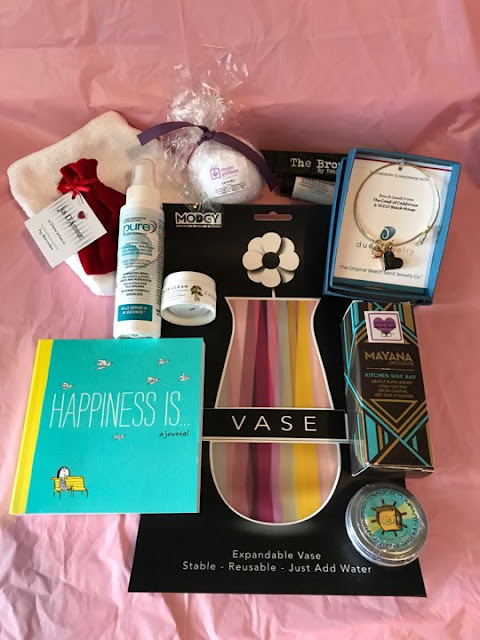 You can connect via Facebook , @MomGiftBox , Instagram , Pinterest , TheMomGiftBox and TheGiftBox . That expandable vase sounds intriguing! Sure could have used that when my Mom was in Rehab and everyone kept sending her flowers. As a matter of fact I could use it here as well--I rarely have use for a vase (allergic to flowers) but would be great for some artificial ones. That is a great price as well!! I also knoe several other women who would love this box in its entirety. A lot of great products for sure! I think my favorite would be the journal or the bracelet.